The Hawaiian Islands are situated in the North Pacific Ocean and lie between longitudes 154° 40' and 160° 30' West, and latitudes 22° 16' and 18° 55' North. They are thus on the very edge of the tropics, but their position in mid-ocean and the prevalence of the northeast trade wind gives them a climate unequalled by any other portion of the globe—a perpetual summer without an enervating heat. 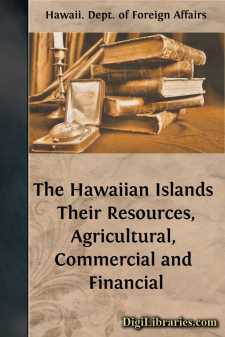 In the Hawaiian Islands Americans and Europeans can and do work in the open air, at all seasons of the year, as they cannot in countries lying in the same latitudes elsewhere. To note an instance, Calcutta lies a little to the north of the latitude of Kauai, our most northerly Island, and in Calcutta the American and European can only work with his brain; hard physical labor he cannot do and live. On the Hawaiian Islands he can work and thrive. The rainfall varies, being greater on the windward side of the Islands, and increasing up to a certain elevation. Thus, at Olaa, on the Island of Hawaii, windward side and elevation of about 2,000 feet, the rainfall from July 1st, 1894, to June 30, 1895, was 176.82 inches, while at Kailua, on the leeward side, at a low level, it was only 51.21 inches during the same period. The temperature also varies according to elevation and position. On the Island of Hawaii you can get any climate from the heat of summer to actual winter at the summits of the two great mountains. A meteorological record, kept carefully for a period of twelve years, gives 89° as the highest and 54° as the lowest temperature recorded, or a mean temperature of 71° 30' for the year. A case of sunstroke has never been known. People make no special precautions against the sun, wearing straw and soft felt hats similar to those worn in the States during the summer months. The prevailing winds, as mentioned above, are the northeast trades. These blow for about nine months of the year. The remainder of the period the winds are variable and chiefly from the south. The Islands are outside the cyclone belt, and severe storms accompanied by thunder and lightning are of rare occurrence. The Islands possess a healthy climate. There are no virulent fevers such as are encountered on the coast of Africa or in the West India Islands. Epidemics seldom visit the Islands, and when they do they are generally light. A careful system of quarantine guards the Islands now from epidemics from abroad. Such grave diseases as pneumonia and diphtheria are almost unknown. Children thrive wonderfully.